(HOST) VPR is celebrating Women’s History Month – and the Champlain quadricentennial – with stories of five women who contributed to the history and culture of the Champlain Valley. Among them is the story of Florence Weld, longest-serving director of Camp Hochelaga on Lake Champlain, told by Mrs. Weld’s granddaughter, Joan Curtis. (CURTIS) Camp Hochelaga in South Hero was established in 1919. It’s the only YWCA-owned and -operated residential, girls-only summer camp left in the country. For ninety years, its mission has been to provide opportunities for women and girls to develop new skills, explore interests, assume leadership roles, and gain a rapport with nature. From 1939 to 1962 my grandmother, Florence Weld, was the longest serving director in the camp’s history. When I was a Hochelaga camper in the 1940s and ’50s, I saw her in action – a formidable figure, never without her pearl earrings, worn with a pastel or white summer dress and stockings. She expected proper deportment and posture, causing nervousness among the campers assigned to sit at her table in the dining room. Luckily she also had a marvelous sense of humor and when she laughed, she often had to grab her pince-nez spectacles before they fell off her nose. Florence Duncan spent her childhood in East Jaffrey, New Hampshire. Both she and her husband-to-be graduated from Middlebury College, where she was the chapel organist. Following college she taught in local schools and in 1909 married Garfield Weld of Bradford. Garfield was hired to teach mathematics at the Taft School in Watertown, Connecticut. They had three children there, and Florence continued her work as a church organist. During the summers, she helped her husband and his brother run a camp for boys in the Adirondacks. But Garfield suffered from depression and committed suicide in 1933. That same year, their son Robert died in a canoing accident. To cope with this devastating loss – and to support herself – Florence became a house director at Smith College, and later at Lyman Hall at the University of Vermont. Then Vermont YWCA trustees asked her to take on the leadership of Hochelaga. 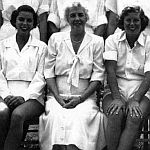 Hazel Wills, the Vermont governor’s wife from Bennington, was part of the job search and the two women became life-long friends and traveling companions. As Camp Director, my grandmother met challenges creatively – like coping with food shortages during World War II. She built a strong staff of counselors – including some of her young acquaintances from Smith – with skills in waterfront, drama, arts and crafts, sports, and outdoor education. She gave her counselors freedom and responsibility. They revered her and valued her wisdom. Her mischievous humor kept them on their toes. I was present once in the counselor’s lounge, when she made an entrance and spontaneously lifted her skirts – kicking up and touching the naked light bulb hanging from the ceiling – to everyone’s great amazement. She was probably 60 years old at the time. She is remembered as kind but firm. According to one former troubled camper, now a successful scholar, she had a way of understanding excess, of finding a place for it to go, channeling it, disciplining it when necessary… She knew how to honor youthful exuberance. Under Florence Weld’s directorship, Camp Hochelaga on Lake Champlain became a place of legend for many young women. 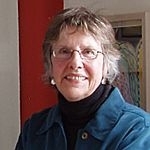 (TAG) You can find this commentary by Joan Curtis – and more stories of notable Vermont women – on-line at VPR-dot-net. Tomorrow, we’ll hear about Sadie White, Winooski mill worker, long-time state legislator, and preservationist. Note: This series is presented in celebration of Women’s History Month and the Champlain Quadricentennial. All this week, VPR has been observing Women’s History Month – and the Champlain quadricentennial – by honoring Vermont women who contributed to the history and culture of the Champlain Valley. Louise Lampman-Larivee is the greatgranddaughter of the Abenaki woman from Swanton known as Grandma Lampman, who was known for her knowledge of tribal customs and medicinal herbs. VPR is observing Women’s History Month – and the Champlain quadricentennial – by honoring five women who contributed to the history and culture of the Champlain Valley. Today, Julia Lewandoski* has the story of Sadie White – Winooski mill worker, long-time state legislator, and preservationist.